Forest Garden Oakley Summerhouse: The Forest Garden Oakley Summerhouse is a beautiful wooden summerhouse with pressure treated overlap cladding a solid timber board floor. The Oakley is designed to let in plenty of natural light, with large double doors, 3/4 windows, and side windows. Multiple windows are glazed with a shatter-resistant and lightweight acrylic for safety and protection. The summerhouse is supplied with high quality mineral felt to weatherproof the roof, and the overlap cladding ensures that water runs off the surface of the building. The floor is a solid timber board construction, providing lots of strength and ensuring it can support of lot of interior weight. All wooden components are pressure treated, ensuring protection from various hazards associated with wooden outdoor buildings, and the wood is guaranteed by Forest for 15 years against rot. A welcoming and inviting wooden summerhouse, Forest Garden's Oakley comes in three sizes depending on your needs and available space. 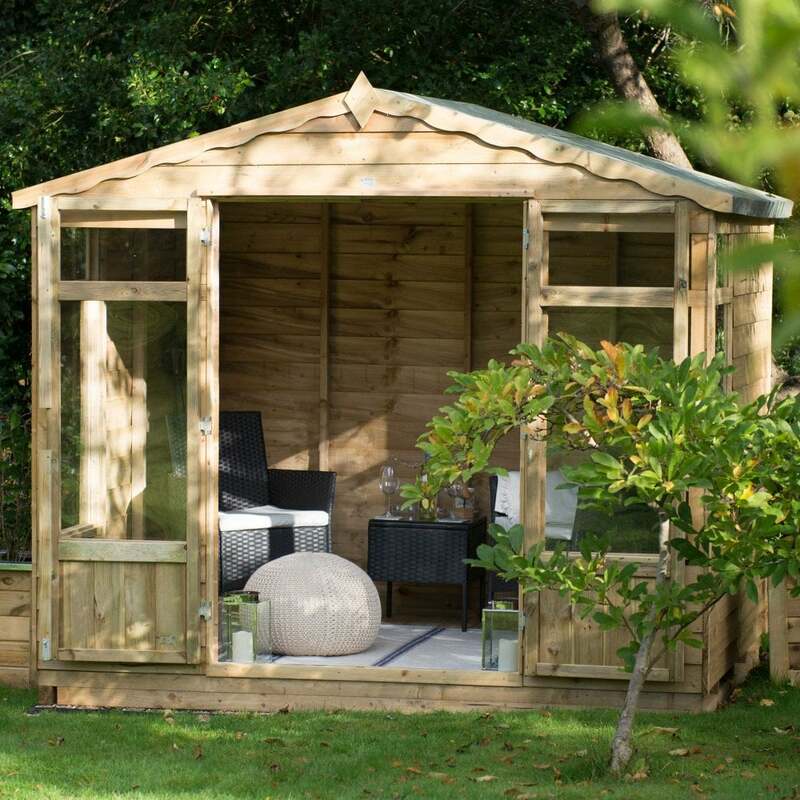 This sturdy and long lasting summerhouse is sure to add lots of functionality to your garden, and will be a light, airy, and charming space for relaxing for many years to come. The summerhouse is supplied with all necessary fixings to complete the build, as well as easy-to-follow self-assembly instructions to construct the summerhouse at home.